Jeffrey would need to put a bad beat on Mark to survive, and he did just that when the board ran out [Ac][5h][3d][6h][9d]. Jeffrey had just under 3 million prior to this hand, so the stacks are almost even now. Mohd Eid was all in preflop holding [Ah][Th] against the [8s][8c] of Mark Dube. 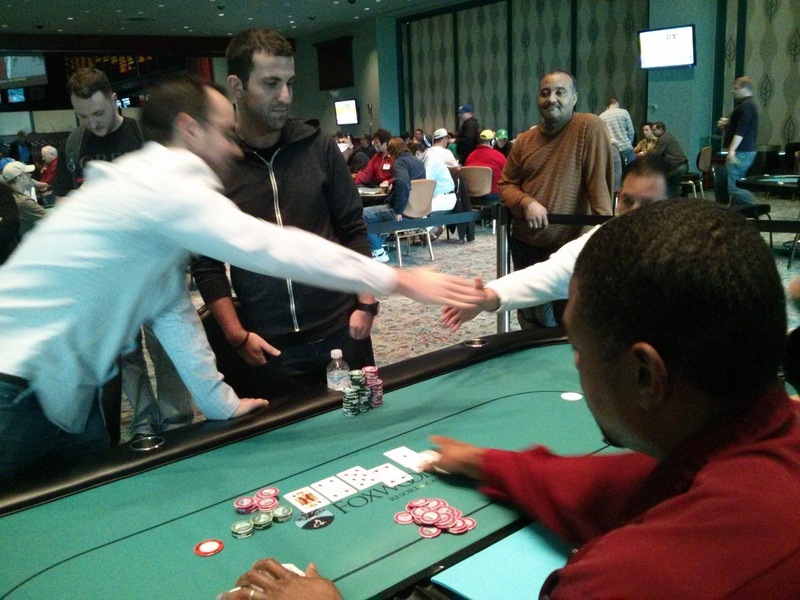 The crowd was on their toes to watch the flop fall [4d][5s][3s], opening up a few outs for Mohd. The [9s] on the turn kept Mark in front, but gave Mohd 16 outs for the win. 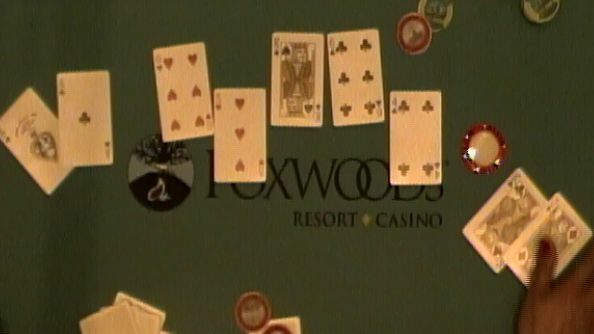 When Mohd paired his ace on the river, he celebrated his double up and Mark bemoaned his loss, until someone in the rail pointed out that it was the [As] and that completed Mark's flush. Mohd's emotions were flipped upside down as he realized he was eliminated in 3rd place, but he does have $34,914 to console him. 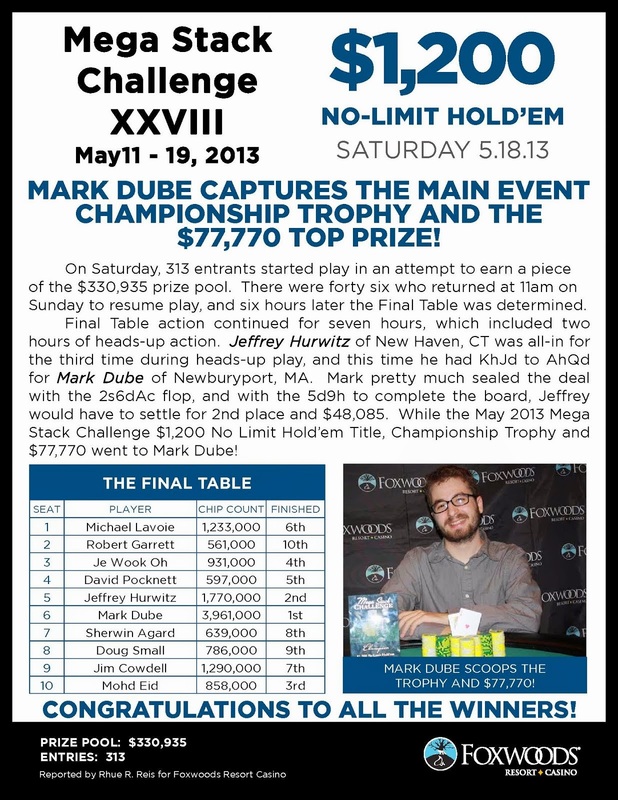 Jewook Oh moved all in from the button holding [Qd][Jd] and Jeffrey Hurwitz moved in all over the top from the small blind holding [Ad][Qc]. 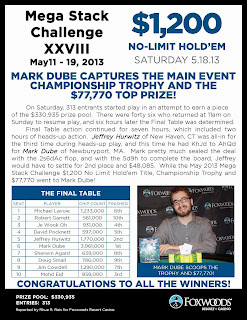 Mark Dube reluctantly folded his big blind, and the dealer fanned the [9h][3s][Ac]. Jewook would need runner runner to stay alive, but the [6h] turn left Jewook drawing dead. By the time the [Kd] hit the river, Jewook was shaking his opponents' hands and heading to the payout desk. He will collect $25,813 for his 4th place finish. The final 4 players are now on a 10 minute break. When they return, the blinds will be 40,000/80,000 with a 10,000 ante. 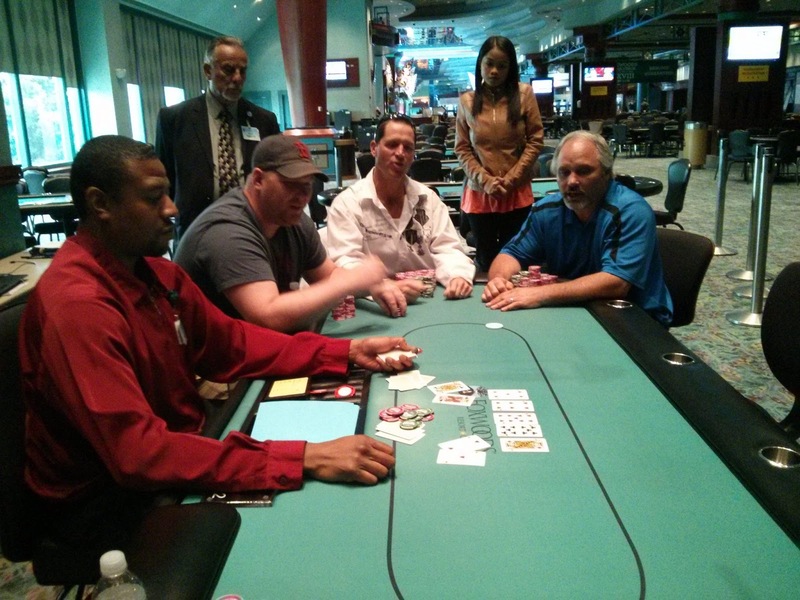 David Pocknett was all in with ace nine against the pocket sevens of Mohd Eid. It was a race, but the [5c][Jh][2c][5s][6s] board kept the pocket pair in front. David will exit this tournament in 5th place, good for $19,359. 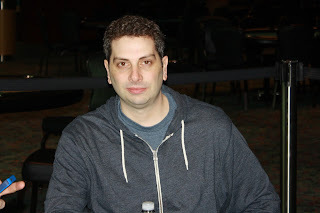 David had picked up a gutshot straight draw to go with his overcard by the turn when the board read [6h][Ac][Ah][Ts], but the [6c] river delivered Jewook a little more than a double-up. Jewook Oh (standing) has eliminated Mihael Lavoie (bottom left) in 6th place, good for $14,760. 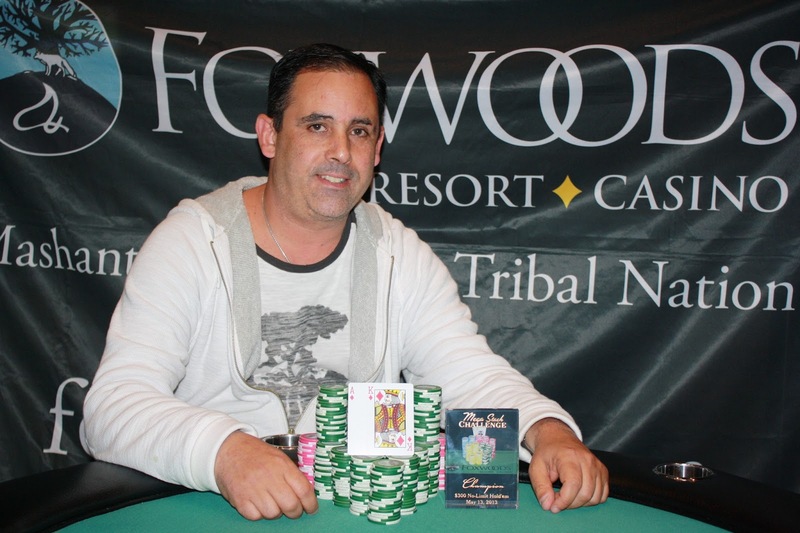 On a [Kd][5s][Jh] flop, Jim Cowdell moved all in holding Q-T. Jeffrey Hurwitz made the all with [Kc][8c], and would knock Jim out if he didn't hit his open ended straight draw. The [2h] turn and [4h] river failed to deliver what Jim needed, and he was sent to the payout desk to collect $11,450 for his 7th place finish. 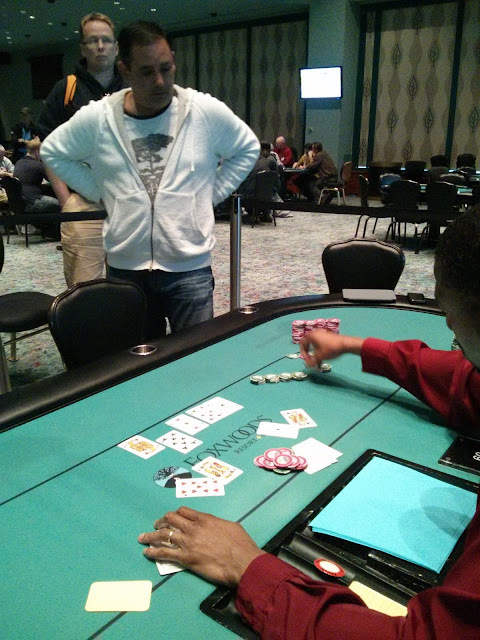 On a [Qd][4h][Tc] flop, Sherwin Agard had coolered Jewook Oh as Sherwin's [Ah][Ac] was well in front of Jewook's [As][Qs]. The dealer burned and turned the [Qc], however, to turn the tables and leave Sherwin drawing to one out. The [7c] was not the right card for him, and he was crippled down to a few chips. 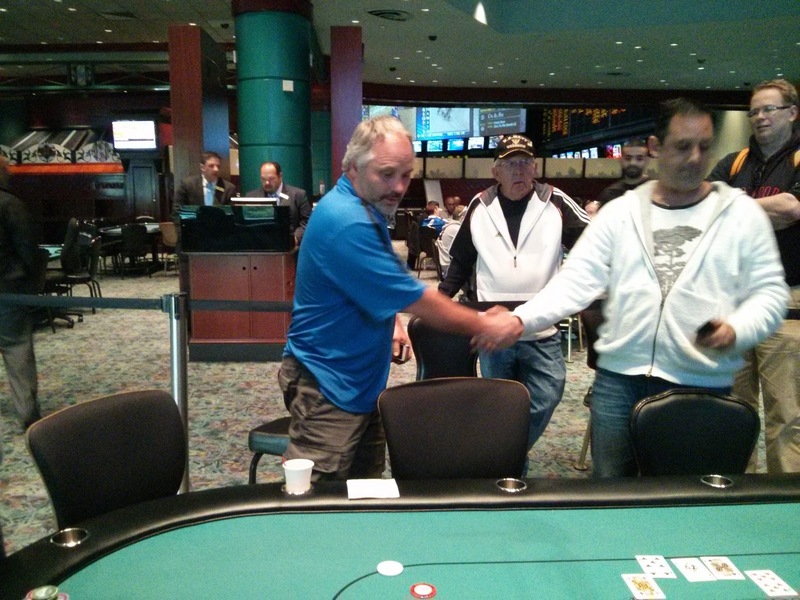 A few hands later, he was eliminated in 8th place, good for $9,002. 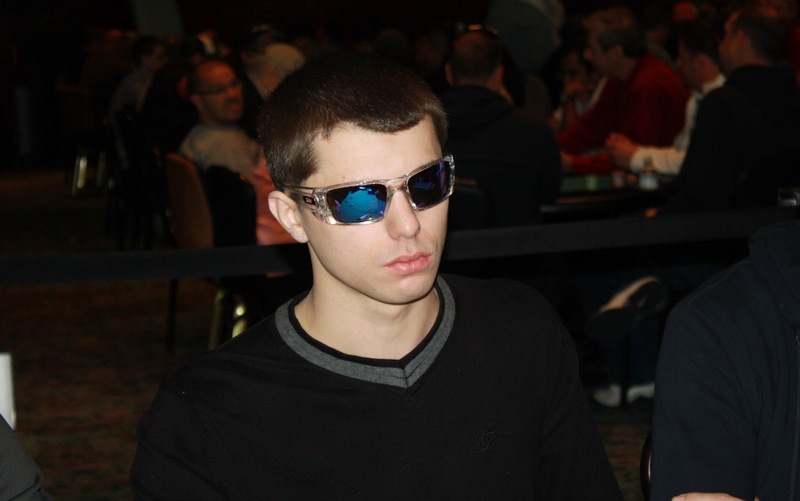 Doug Small pushed the last of his chips in with [8d][7c] and was called by Michael Lavoie holding [Ks][Kc]. The board ran out [5c][5d][3c][4d][Ac] to send Doug to the rail in 9th place, good for $7,189. 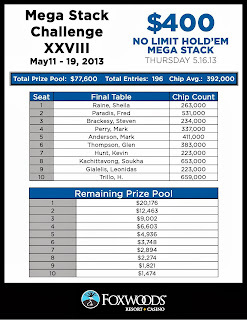 The final 9 players of the $1,200 Mega Stack Main Event are now on a 1 hour dinner break. 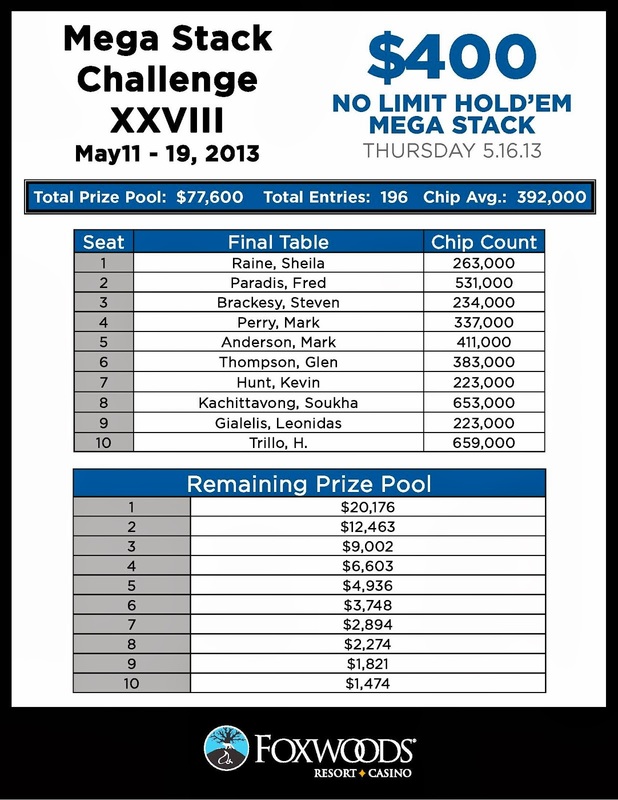 Play will resume at approximately 7pm EST, and blinds will be 20,000/40,000 with a 5,000 ante. Robert Garrett has been eliminated when he ran his pocket queens into the pocket aces of David Pocknett. 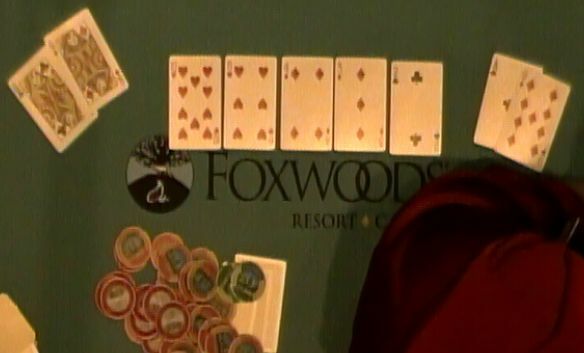 An ace flopped to give David a set, so the queen on the river couldn't save Robert's tournament life. He will collect $5,824 for his 10th place finish. 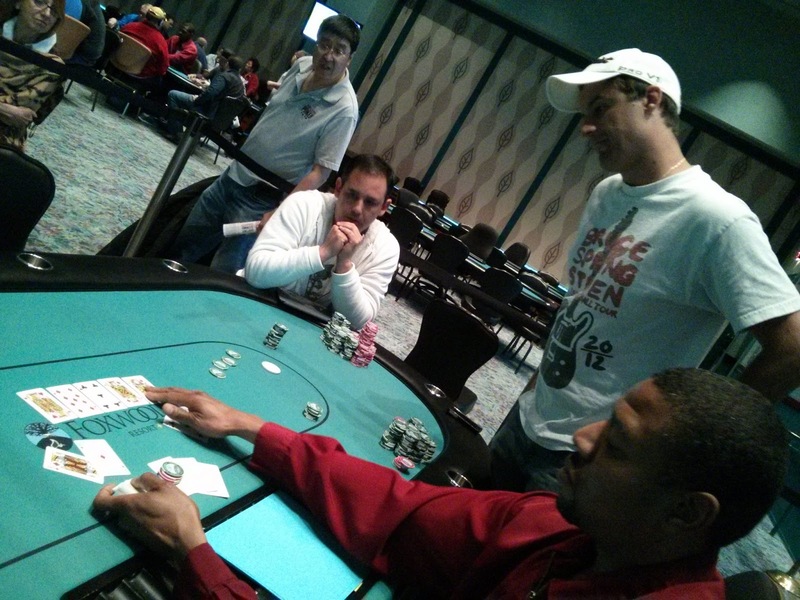 The first all in and a call at this final table put the animated Sherwin Agard at risk. He held [Qh][Qc] against his opponent's [Ah][Jc]. 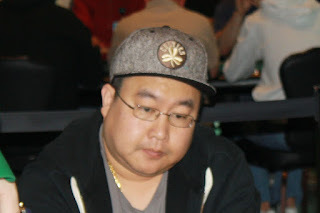 Sherwin had a bit of a sweat as his opponent flopped top pair on the [Jh][7c][4c] flop, and the [3c] gave his opponent even more outs with a flush draw. 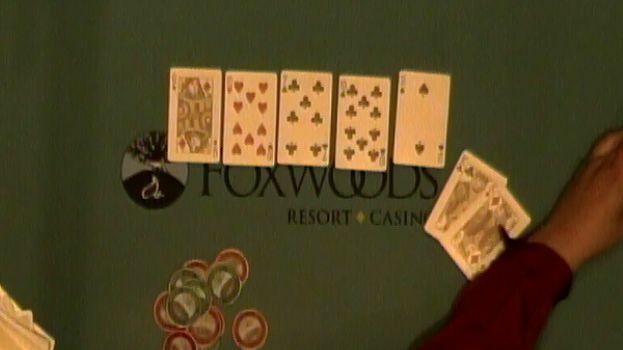 The [6s] river was the blank Sherwin was begging the dealer for, and he doubled up, exclaiming, "The chip taker is real!" Our 11th place finisher busted out with [Ks][6s] against [Ts][Td]. 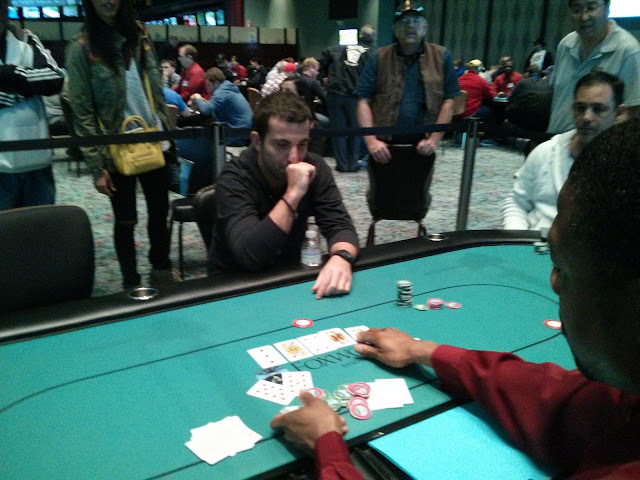 His opponent hit a set on the flop, and that was it. The clock has been paused, and the final table will start shortly. Since the bubble burst, bustouts have gone quickly. 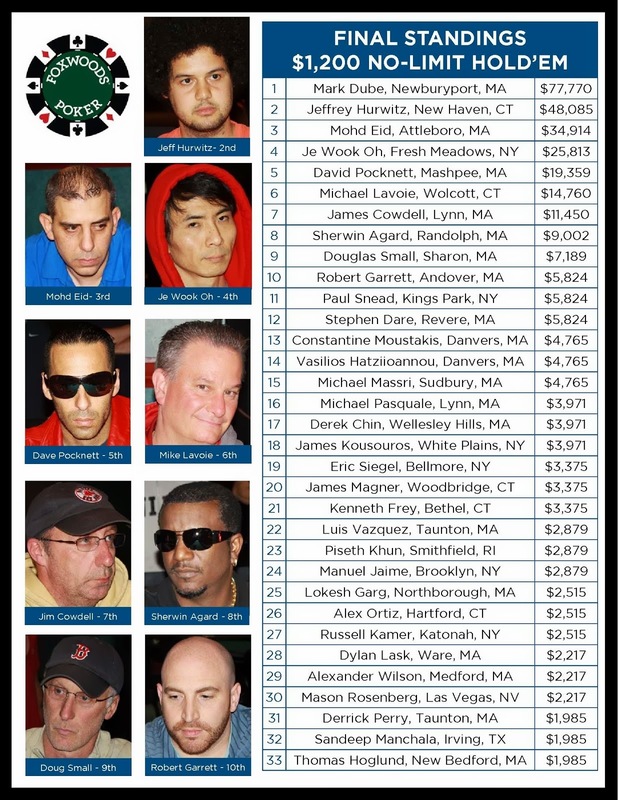 We are now down to 27 players from the 33 that made the money, and they are all redrawing for new seats. Play will restart shortly. Pocket aces were the hand that burst the bubble, as a short stacked player was forced all in with [Qd][9d] and failed to improve. The remaining 33 players are now in the money. 34 players remain, which mean that the $1,200 Mega Stack Main Event is now hand for hand. The next player to go out will not cash, but the remaining 33 players will be guaranteed at least a $1,985 payday. The players have taken their seats and the cards are back in the air. Day 2 of the $1,200 Mega Stack Main Event begins now, with blinds continuing at 4,000/8,000 with a 1,000 ante. 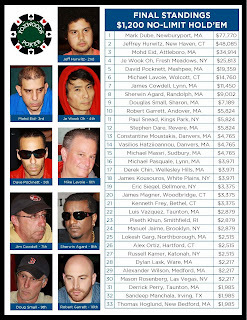 46 players remain, with the top 33 making the money. Full payouts are available here. 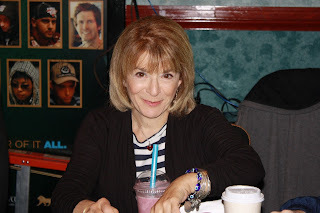 You can watch our featured table streaming live at www.FoxwoodsLive.com. With ten minutes left on the clock, the tournament staff has instructed the dealers to deal four more hands on each table before play is complete for the night. The board currently shows 49 players remaining, so likely a few less than that will be returning tomorrow at 11am EST to play down to a winner. The 56 remaining players from the $1,200 Mega Stack Main Event are now on their last 10 minute break of the night. 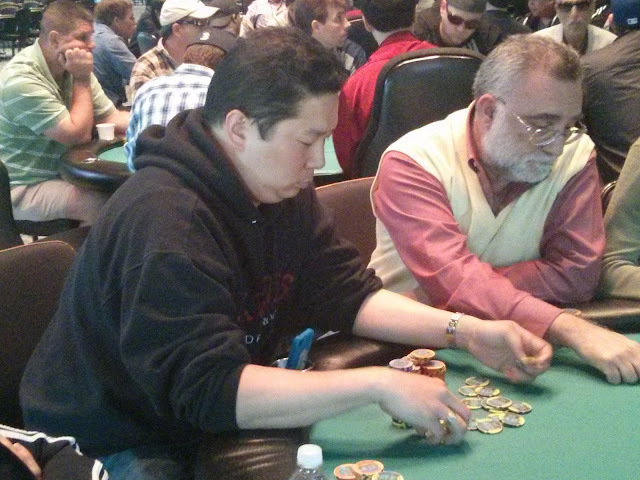 The tournament staff are now coloring up and racing off the 500 chips. Blinds will be 3,000/6,000 with a 1,000 ante when the players return, and after that level the remaining players will bag up their chips and return tomorrow at 11am EST. 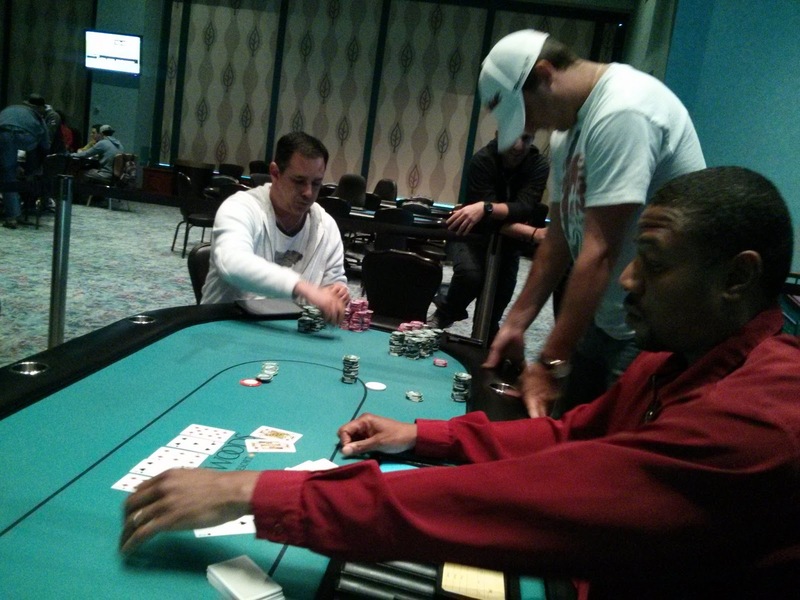 Steven Shackleton was all in preflop with [Ks][5s] against the [Ad][Kd] of Eric Siegel. 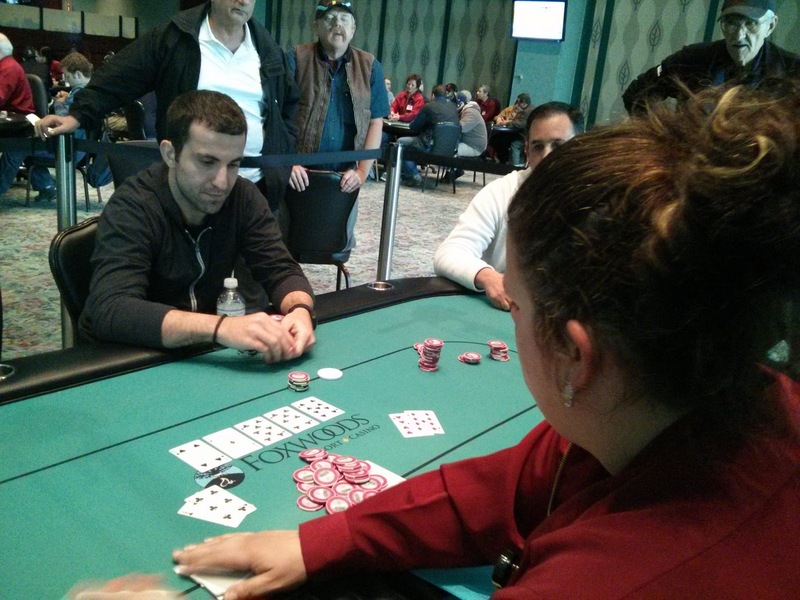 Steven was able to spike a pair on the [Jh][9d][5c] flop, but Eric picked up a flush draw on the [Jd] turn. 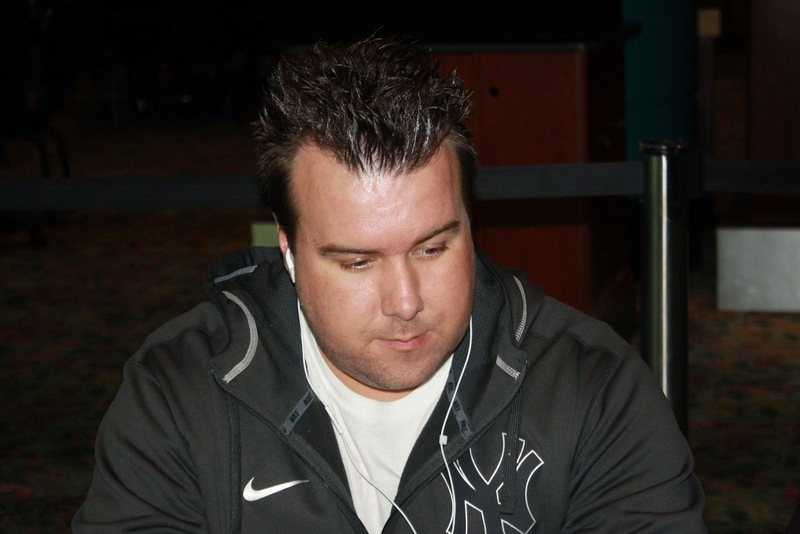 The [Qd] river completed Eric's flush, sending Steven to the rail in 2nd place. Eric Siegel will take home $31,301 for his 1st place finish, and he will take home the Foxwoods Mega Stack trophy. Congratulations! 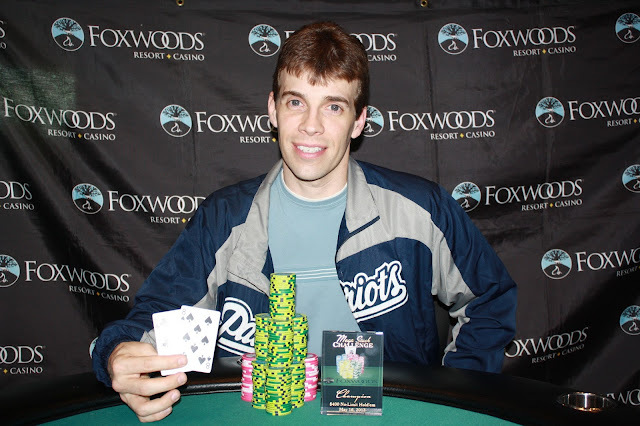 Eric Siegel was outchipped almost 3 to 1 against Steven Shackleton before these two hands. On the first, Eric doubled up holding [Ac][4d] against Steven's [Kh][3h]. The [Ad][9s][Kc][Qh][7d] board gave Eric the winning pair of aces, and he got a double-up to almost even out the stacks. On the very next hand, Eric was all in again, this time holding [Ah][2s] to Steven's [Kh][Jd]. Again, the best hand held up through the [9d][4s][6d][5s][Td] board. Steven was left with a little over 400,000, but was able to double up a few hands later with [Ah][8s] against Eric's [Qc][Ts]. 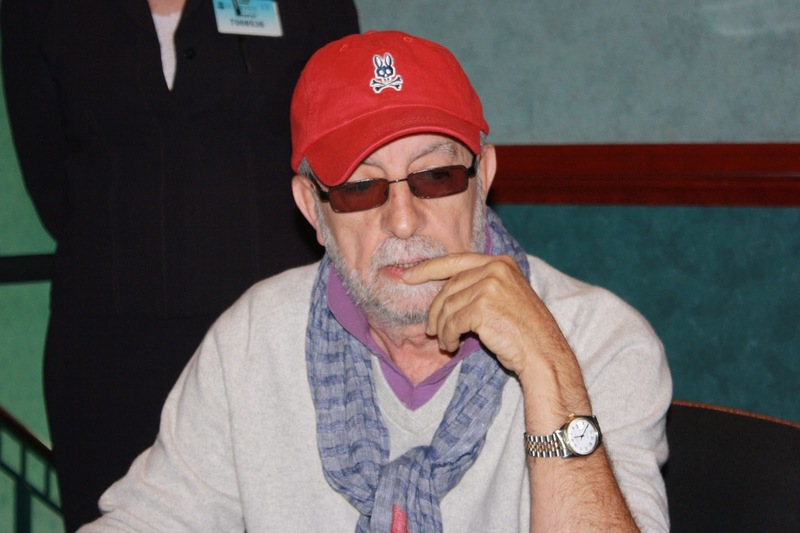 Albert Muir has been eliminated in 3rd place when his ace ten failed to improve against the ace king of Eric Siegel. Albert will earn $14,160 for his efforts. 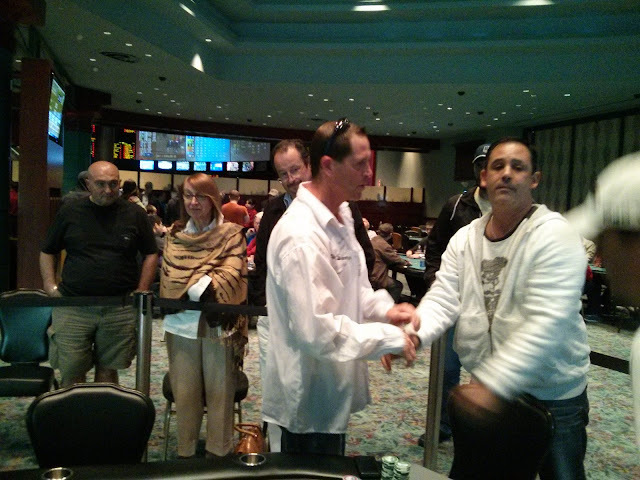 Eric Siegel was all in preflop holding [Kd][Kc] against the A-Q of Albert Muir. The [Qd][Th][7c] gave Eric a bit of a scare, but the five outer never materialized through the [Tc] turn and [2s] river. Michael Nye was all in with [Jc][Ts] against the A-[7s] of Steven Shackleton. Michael found a pair on the J-7-A flop, but Steven's two pair would be hard to overcome. The [Ks] turn and [Th] river failed to improve Michael's hand, and he will exit this tournament in 4th place. He will earn $10,493 for his efforts. 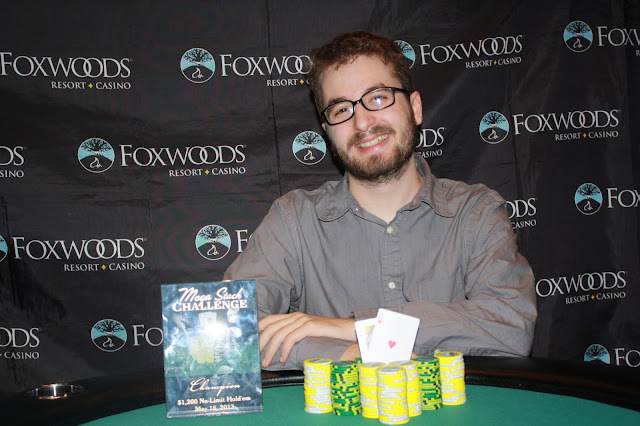 Eric Siegel was all in for his tournament life holding [Kh][9h] vs. the [Ad][Kc] of Steven Shackleton. Eric would need a lot of help, and he did find a flush draw on the [Jh][8c][3h]. The [7h] on the turn was just what Eric needed, though the card devastated Steven. The [Ac] gave Steven a losing top pair hand, and Eric earned the double up. 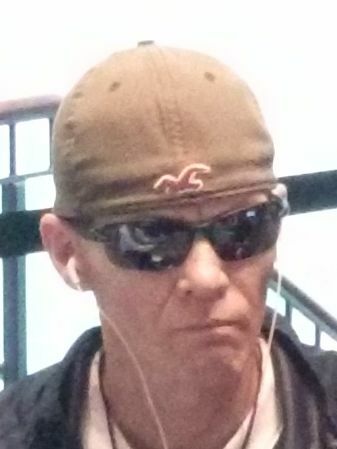 Carl Priest was all in preflop by the [Ah][2h] and was called by Albert Muir holding [Ks][Qc]. The flop fell [5d][6h][9h], jeeping Carl in front with ace high and giving him a flush draw. Albert would need a king or a queen, but the [Tc] on the turn gave him a gutshot as well. The river fell the [Jd], filling Albert's gutshot and sending Carl to the rail in 5th place, good for $7,899. With pocket nines in the muck, Steven had little to worry about. The [3s][Qc][4d] changed nothing, but the [Kd] opened up straight and flush draws for Haralambos. 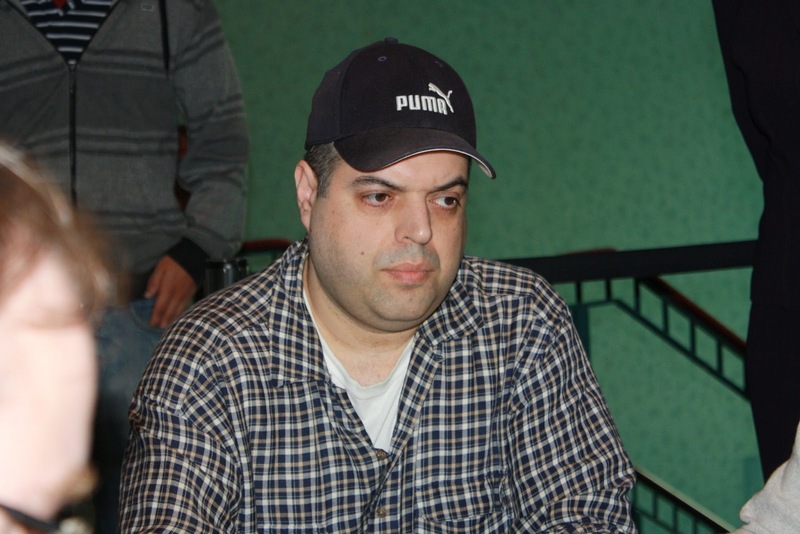 The [Kc] hit the river, however, to give Steven quad kings and send Haralambos to the rail in 6th place, good for $6,022. 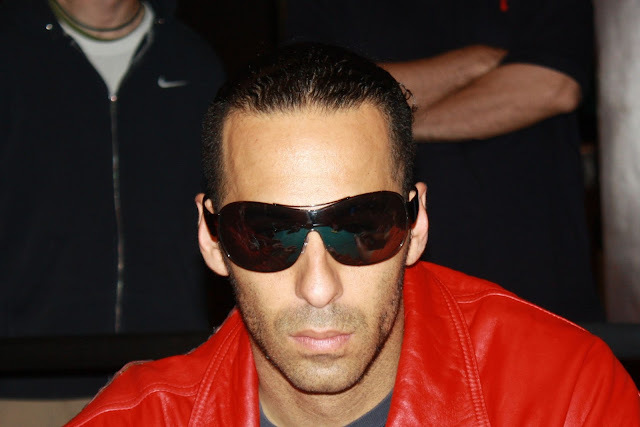 Eric Siegel was all in preflop holding the [9h][9d] against the [Ac][6c] of Haralambos Saridis. The [4s][Ad][8c] was unfavorable to Eric, and the [7c] on the turn left Eric drawing to just one out, as the [9c] would give Haralambos the nut flush. Amazingly, the [9s] fell on the river to give Eric the winning set. John Germano has been eliminated in 7th place when his K-J failed to outrun Michael Nye's A-K. John will collect $4,621 for his efforts. 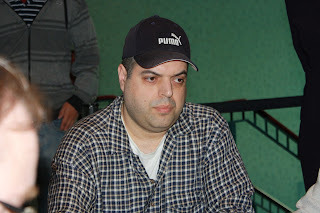 Derek Medeiros was eliminated in 8th place when his [Qc][Ts] failed to improve against the [9d][9c] of Steven Shackleton. 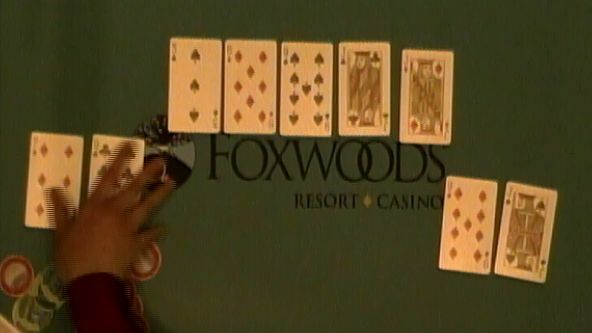 Steven rivered an unnecessary flush when the board fell [Kd][4d][8d][4h][Ad], and Derek was sent to the rail to collect $3,651.